The Molex Brad Ultra-Lock system is designed to bring the ease of a push-pull connector to IP67/IP68/IP69K rated sealed connections in industrial environments. The M12-compatible Brad Ultra-Lock technology provides a seal that surpasses the performance and reliability of traditional threaded connectors. 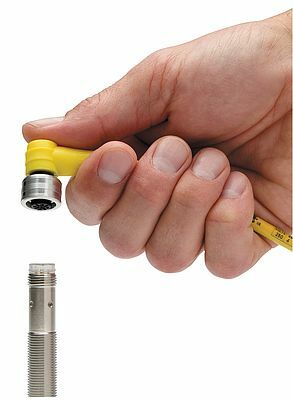 “Unlike the seal torque integrity of traditional threaded connectors, which are operator dependent, Ultra-Lock connectors form a secure seal simply by aligning and pushing. A superior seal means fewer intermittent signals, less downtime for industrial operations, and increased productivity for valued customers,” says Michael Meckl, global product manager, Molex. The positive-locking Ultra-Lock design with built-in reliability eliminates the need to turn a coupler and connector-related intermittent signals due to harsh conditions or installer error resulting in a loose connection. Providing safe, reliable connection of sensors, actuators and other control devices, the operational benefits of the Ultra-Lock technology continue to grow over time, including up to an 80 percent reduction in electrical commissioning of industrial machinery and automation systems. The ability to change machine configurations quickly, without the need to hire a licensed electrician, can yield up to a 50 percent reduction in total installed cost. Brad Ultra-Lock connectors are designed to remain securely mated under the stresses of machine vibration, cable pulls and in-plant traffic of workers and mobile vehicles. The patented technology incorporates a mechanical locking feature and radial o-ring compression seal to lock out moisture, water, dust, solvents and other chemical contaminants. Installed with a single push, the stainless steel IP69K rated Ultra-Lock repeatable seal can withstand high-pressure washdowns up to 1,500 PSI. Suitable for power, signal or communication connections, including Ethernet and USB connections, the Brad Ultra-Lock sealed connection system expedites commissioning of equipment and machinery, including commercial vehicles, industrial automation controls and equipment, food and beverage processing applications, telecommunications base stations, material handling equipment and petrochemical machinery. Rated for Class 2 power and network circuit applications, Ultra-Lock connections are rated to 250V AC/DC, and up to 4.0 A.